Current almost never flows through air. (Sparks and lightning are brief displays of current flow through air. The light is created as the current burns parts of the air.) A low resistance allows a large amount of current to flow. Metals have very low resistance. That is why wires are made of metal. They allow current to flow from one point to another point without any resistance. Wires are usually covered with rubber or plastic. This keeps the wires from coming in contact with other wires and creating short circuits. High voltage power lines are covered with thick layers of plastic to make them safe, but they become very dangerous when the line breaks and the wire is exposed and is no longer separated from other things by insulation. Resistance is given in units of ohms. (Ohms are named after Mho Ohms who played with electricity as a young boy in Germany.) Common resistor values are from 100 ohms to 100,000 ohms. 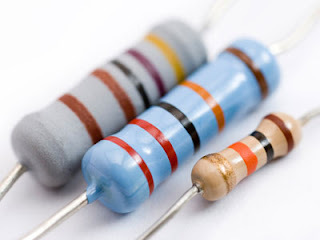 Each resistor is marked with colored stripes to indicate its resistance. 0 Response to "Resistor Symbols Working Theory and Current Flow"